New Caledonia (French: officially: Nouvelle-Calédonie; colloquially: (la) Calédonie; popular nicknames: (la) Kanaky, (le) Caillou), is a "sui generis collectivity " of France located in the subregion of Melanesia in the southwest Pacific. It comprises a main island (Grande Terre), the Loyalty Islands , and several smaller islands. Approximately half the size of Taiwan , it has a land area of 18,575.5 square kilometres (7,172 sq mi). The population was estimated in January 2009 to be 249,000. The capital and largest city of the territory is Nouméa . The currency is the CFP franc. Since 1986 the United Nations Committee on Decolonization has included New Caledonia on the United Nations list of Non-Self-Governing Territories. New Caledonia is set to decide whether to remain within the French Republic or become an independent state in a referendum to be held between 2014 and 2019. Nouméa , the capital, is also the seat of the Secretariat of the Pacific Community (formerly the South Pacific Commission), an international organization. The name Caledonia derives from the Latin name of an area corresponding to modern Scotland , and used as a poetic name for Scotland under the influence of Neo-Classicism. The rugged coastline of New Caledonia allegedly reminded Captain Cook (whose father was a Scot) of Scotland, and he thus named it New Caledonia. In French, Nouvelle-Calédonie is the official name, but the territory is often called only Calédonie in colloquial use, as in l'histoire de la Calédonie. The adjective néo-calédonien(ne) is seldom used; calédonien(ne) is the term most often used, even by official institutions, as in l'économie calédonienne ("the New Caledonian economy"). The nickname (le) Caillou (literally "the stone" or "the pebble") is used as an endearing term by the European community of New Caledonia to designate the territory. It allegedly refers to the main island of New Caledonia which is a nickel-rich, long rock formation emerging from the Pacific Ocean. Another nickname, (la) Kanaky, is also used in French (usually by independence movements), English and the indigenous languages. This name is favored by Melanesian nationalists. The word comes from kanaka, a Hawaiian word (elsewhere tangata and variants) meaning "human/person/people", used by Polynesians to refer to themselves. The word was later used by the French to refer to all the indigenous inhabitants of the South Pacific Ocean, including the Melanesian (non-Polynesian) native inhabitants of New Caledonia. The word, turned into Canaque in French, became derogatory. In the 1960s and 1970s, when the Melanesian native inhabitants started to organize themselves into political parties and call for independence, the word was transformed into a symbol of political emancipation and pride. In 1983, during the period of political turmoil, the terms Kanak and Kanaky became political brand names and colonial whites realized the name had changed into a political statement. The official name of the territory, Nouvelle-Calédonie, could be changed in the near future due to the Nouméa Accord of 1998 which stated that "a name, a flag, an anthem, a motto, and the design of banknotes will have to be sought by all parties together, to express the Kanak identity and the future shared by all parties." To date, however, there has been no consensus on a new name for the territory. The Western Pacific was first populated by humans about 3,000 years ago. The Austronesians moved into the area later. The diverse group of people that settled over the Melanesian archipelagos are known as the Lapita. They arrived in the archipelago now commonly known as New Caledonia and the Loyalty Islands around 1500 BC. The Lapita were highly skilled navigators and agriculturists with influence over a large area of the Pacific. Europeans first sighted New Caledonia and the Loyalty Islands in the late 18th century. The British explorer James Cook sighted Grande Terre in 1774 and named it New Caledonia, Caledonia being a Latin name for Scotland. During the same voyage he also named the islands to the north of New Caledonia the New Hebrides (now Vanuatu ), after the isles off the west coast of Scotland. Whalers operated off New Caledonia during the 19th century. Sandalwood traders were welcome but as supplies of sandalwood diminished, the traders became abusive. The Europeans brought new diseases such as smallpox, measles, dysentery, influenza, syphilis, and leprosy. Many people died as a result of these diseases. Tensions developed into hostilities, and in 1849 the crew of the American ship Cutter were killed and eaten by the Pouma clan. As trade in sandalwood declined, it was replaced by a new form of trade, "Blackbirding". Blackbirding was a euphemism for enslaving people from New Caledonia, the Loyalty Islands , New Hebrides , New Guinea , and the Solomon Islands to work in sugar cane plantations in Fiji and Queensland. The trade ceased at the start of the 20th century. The victims of this trade were called Kanakas, a label later shortened to Kanak and adopted by the indigenous population after the French annexation. New Caledonia was made a French possession in late 1853, a part of an attempt by Napoleon III to rival the British colonies in Australia and New Zealand. Auguste Febvrier Despointes led the expedition that seized the island. Following the example set by the United Kingdom in parts of nearby Australia, France sent a total of 22,000 convicted felons to penal colonies along the south-west coast of New Caledonia between 1864 and 1922. This number included regular criminals as well as political prisoners such as Parisian socialists and Kabyle nationalists. Towards the end of the penal colony era, free European settlers (including former convicts) and Asian contract workers by far outnumbered the population of forced workers. The indigenous Kanak populations declined drastically in that same period due to introduced diseases and an apartheid-like system called Code de l'Indigénat which imposed severe restrictions on their livelihood, freedom of movement and land ownership. During World War II, the French South Pacific colonies of New Caledonia, French Polynesia and the New Hebrides joined the Free French Forces. Assisted by Australia, the South Pacific colonies became vital Allied bases in the Pacific Ocean . American Allied forces built up a major naval base in New Caledonia to combat the advance of Imperial Japan toward Australia, New Zealand, and the Solomon Islands . If left unchecked, Japanese advances threatened to sever the sea lanes between North America and Australia. Nouméa served as a headquarters of the United States Navy and Army in the South Pacific. Due to the proximity of the territory to the South Pacific operations, Nouméa also provided a repair base for damaged American and Allied ships. Nouméa declined in importance as a naval and military base as the American and Allied offensive rapidly moved north and over the Equator. The Allied military headquarters – a pentagonal complex – was, after the war, taken over as the base for a new regional intergovernmental development organisation: the South Pacific Commission, later known as the Secretariat of the Pacific Community. New Caledonia has been on the United Nations list of non-self-governing territories since 1986. Agitation by the Front de Libération Nationale Kanak Socialiste (FLNKS) for independence began in 1985. The FLNKS (led by the late Jean-Marie Tjibaou, assassinated in 1989) advocated the creation of an independent state of "Kanaky". The troubles culminated in 1988 with a bloody hostage taking in Ouvéa. The unrest led to agreement on increased autonomy in the Matignon Accords of 1988 and the Nouméa Accord of 1998. This Accord describes the devolution process as "irreversible" and also provides for a local Caledonian citizenship, separate official symbols of Caledonian identity (such as a "national" flag), as well as mandating a referendum on the contentious issue of independence from the French Republic sometime after 2014. New Caledonia has a unique status between that of an independent country and a normal Overseas department of France. On the one hand, both a Territorial Congress (Congress of New Caledonia) and government have been established, and are increasingly empowered via the gradual implementation of a devolution of powers from France in favour of New Caledonia, pursuant to the 1998 Nouméa Accord. Key areas (e.g. taxation, labour law, health and hygiene, foreign trade, and others) are already in the hands of the Territorial Congress and government. Further authority will be given to the Territorial Congress in the near future. Ultimately, the French Republic should only remain in charge of foreign affairs, justice, defense, public order, and the treasury. An additional enhancement to New Caledonian autonomy has come in the form of recently-introduced territorial "citizenship": Only New Caledonian "citizens" have the right to vote in local elections. The introduction of this right has been criticised because it creates a second-class status for French citizens living in New Caledonia who do not possess New Caledonian "citizenship" (because they settled in the territory recently). Further signs of increased autonomy for the territory include New Caledonia's right to engage in international cooperation with independent countries of the Pacific Ocean region, the continued use of a local currency (the French Pacific Franc, or CFP) rather than the Euro, as well as the authority of the Territorial Congress to pass statutes overriding French law in a number of areas. On the other hand, New Caledonia remains a part of the French Republic. The inhabitants of New Caledonia are French citizens, carry French passports and take part in the legislative and presidential French elections. The Nouméa Accord provides a mechanism for the determination of the ultimate status and degree of New Caledonian territorial autonomy: pursuant to the Accord, the Territorial Congress will have the right to call for a referendum on independence at any time of its choosing after 2014. The current president of the government elected by the territorial Congress is Philippe Gomès, from the loyalist (i.e. anti-independence) "Caledonia Together" party (Calédonie Ensemble), which split from "Future Together" (Avenir Ensemble) in 2008. "Future Together" is a party of mostly White and Polynesian New Caledonians opposed to independence, but rebelling against the hegemonic and (allegedly) corrupt anti-independence RPCR, led by Jacques Lafleur. Their toppling of the RPCR (until then seen as the only voice of New Caledonian Whites) was a surprise to many, and a sign that New Caledonian society is undergoing changes. "Future Together," as the name implies, is opposed to a racial-oriented vision of New Caledonian political life, one based purely on the political primacy of either the Melanesian native inhabitants or the descendants of European settlers. Rather, it is in favour of a multicultural New Caledonia that retains its existing relationship with France, of governing principles that better reflect the reality of the existence of large populations of Polynesians, Indonesians and other immigrant communities that make up the territory's population. Some members of "Future Together" are even in favour of some form of autonomy or independence, though not necessarily on the same basis as the Melanesian independence parties which seek full independence for New Caledonia. The representative of the French central state in New Caledonia is the High Commissioner of the Republic (Haut-Commissaire de la République, locally known as "haussaire"), who is the head of civil services, and who sits as an integral part of the territorial government. New Caledonia is located around in the southwest Pacific Ocean, approximately 1,200 kilometres (746 mi) east of Australia and 1,500 kilometres (932 mi) northwest of New Zealand. The island nation of Vanuatu lies to the northeast. New Caledonia is made up of a main island, the Grande Terre, and several smaller islands, the Belep archipelago to the north of the Grande Terre, the Loyalty Islands to the east of the Grande Terre, the Île des Pins (Isle of Pines) to the south of the Grande Terre, the Chesterfield Islands and Bellona Reefs further to the west. A territorial dispute exists with regard to the uninhabited Matthew and Hunter Islands , which are claimed by both France (as part of New Caledonia) and Vanuatu . The Grande Terre is by far the largest of the islands, and the only mountainous island. It has an area of 16,372 square kilometres (6,321 sq mi), and is elongated northwest-southeast, 350 kilometres (217 mi) in length and 50 to 70 kilometres (31–44 mi) wide. A mountain range runs the length of the island, with five peaks over 1,500 meters (4,900 ft). The highest point is Mont Panié at 1,628 meters (5,341 ft) elevation. The total area of New Caledonia is , of those being land. New Caledonia is one of the northernmost parts of a (93%) submerged continent called Zealandia. It sank after rifting away from Australia 60–85 million years ago (mya) and from Antarctica between 130 and 85 mya. New Caledonia itself is separated from Australia since 65 mya, and subsequently drifted in a north-easterly direction, reaching its present position about 50 mya. Along with other Pacific Ocean territories of French Polynesia and Wallis and Futuna , New Caledonia is part of the French Republic . Its official status, unique in the French Republic, is said to be sui generis, because New Caledonia is the only French subdivision that is not a collectivité territoriale. New Caledonia was a colony until 1946, then an overseas territory (territoire d'outre-mer, or TOM) from 1946 to 1999. The capital is Nouméa , the only major conurbation in the territory. South Province (province Sud). Provincial capital: Nouméa . Population: 164,113 inhabitants (2004). North Province (province Nord). Provincial capital: Koné. Population: 44,596 inhabitants (2004). Loyalty Islands Province (province des îles Loyauté). Provincial capital: Lifou . Population: 22,080 inhabitants (2004). It is further subdivided into thirty-three commune. One commune, Poya , is divided between two provinces. The northern half of Poya, with the main settlement and most of the population, is part of the North Province, while the southern half of the commune, with only 122 inhabitants in 2004, is part of the South Province. There are also three administrative subdivisions, simply known as subdivisions in French, with exactly the same names and same boundaries as the three provinces, except that the commune of Poya is entirely contained inside the North Subdivision. Contrary to the provinces, which are full political divisions with provincial assemblies and executives, the administrative subdivisions are merely deconcentrated divisions of the French central state, akin to the arrondissements of metropolitan France, with a Deputy Commissioner of the Republic (commissaire délégué de la République), akin to a subprefect of metropolitan France, in residence in each subdivision's chief town. The subdivision chief towns are the same as the provincial capitals except in the South Subdivision where the chief town is La Foa, whereas the capital of the South Province is Nouméa. Thus, although the provincial assembly of the South Province sits in Nouméa, the South Subdivision's Deputy Commissioner of the Republic is in residence in La Foa. This was decided in order to counterbalance the overwhelming weight of Nouméa in New Caledonia. In addition, a parallel layer of administration exists for Kanak tribal affairs; these are called aires coutumières ("traditional spheres") and are eight in number ( see map of the "aires coutumières"). Their jurisdiction does not encompass non-Kanaks living within these zones. The aires coutumières more or less correspond to the indigenous language areas of pre-French tribal alliances. New Caledonia lies astride the Tropic of Capricorn , between 19° and 23° south latitude. The climate of the islands is tropical, and rainfall is highly seasonal, brought by trade winds that usually come from the east. Rainfall averages about 1,500 millimetres (59 in) yearly on the Loyalty Islands, 2,000 millimetres (79 in) at low elevations on eastern Grande Terre, and 2,000-4,000 millimetres (79–157.5 in) at high elevations on the Grande Terre. The western side of the Grande Terre lies in the rain shadow of the central mountains, and rainfall averages 1,200 millimetres (47 in) per year. There are two main seasons: a dry season, and a warm and wet season. The dry cooler months are from April to November with daily temperature ranges from 17-27 °C. During the wet season (December to March) the temperature can reach 32 °C. The south-east trade winds temper the heat, and evenings are pleasantly cool. The wet season sees the occasional cyclone hitting the islands. New Caledonia is considered one of the world's most botanically-important and critically endangered hotspots. Unlike many of the Pacific Islands, which are of relatively recent volcanic origin, New Caledonia is part of Zealandia, a fragment of the ancient Gondwana super-continent. Zealandia separated from Australia 60–85 million years ago, and the ridge linking New Caledonia to New Zealand has been deeply submerged for millions of years. This isolated New Caledonia from the rest of the world's landmasses, and made it a Noah's Ark of sorts, preserving a snapshot of prehistoric Gondwanan forests. The country still shelters an extraordinary diversity of unique, endemic, and extremely primitive plants and animals of Gondwanan origin, as well as the second largest coral reef in the world. In the past, New Caledonia's wildlife was even more ancient, almost resembling throwbacks to the Mesozoic. New Caledonia was inhabited by Meiolania, a gigantic turtle resembling a dinosaur ankylosaur the size of a car. Another inhabitant of New Caledonia was Sylviornis, a huge bird with a long, reptilian tail that resembles a dinosaur, probably most closely resembling the oviraptors. The dominant predators of New Caledonia were mekosuchine crocodiles, specifically Mekosuchus. These crocs resembled armored, quadrupedal theropod dinosaurs, and fossil remains suggest they were terrestrial and partly arboreal. All of these creatures died out when humans arrived on New Caledonia. Although the majority of the country's citizens are unaware of the extraordinary nature of their country's biological heritage, a few of the country's animals and plants have become somewhat emblematic in local culture. Among the best known is a hen-sized, flightless bird, commonly-known as the Cagou or Kagu, which has a large crest and an odd barking call. Its song and image are frequently seen as nationally-recognized icons. Another commonly used cultural emblem is the Columnar or Cook's Pine (Araucaria columnaris), an important symbol in Kanak culture. The Niaouli tree (also native to Australia and New Guinea ), is of medicinal interest, locally and abroad. Its sap (which contains gomenol, a camphor-smelling compound), is used to treat head colds, and as an antiseptic. It also shows potential to treat other medical ailments. Before the Europeans arrived, there was no mammal other than the Roussette (aka flying fox), a large vegetarian bat, considered a local delicacy. Less well-known by the native population is the fact their country is home to a species of plant, (Amborella trichopoda), believed to be genetically close to the ancestor of all flowering plants, or the fact their nation boasts the largest number and diversity of conifer species in the world, per unit of geographic area (a remarkable fact, given that conifers are usually relatively rare in tropical regions). The islands contain two precipitation zones: Higher-rainfall areas (located on the Loyalty Islands, Isle of Pines (Île des Pins), and on the eastern side of Grande Terre) which support New Caledonia rain forests, and a more arid region, home to the now exceedingly-endangered New Caledonia dry forests, located in the rain shadow on the western side of Grande Terre. Europeans settled on the dry west coast of Grande Terre, leaving the east (as well as the Loyalty Islands and the Isle of Pines) to the Kanaks, and resulting in an ethno-cultural division which coincides with the natural one. Extensive farming by Europeans in the dry forest areas, has caused these forest ecosystems to virtually disappear. It is a vast oversimplification, however, to merely describe New Caledonia's extremely important, complex and diverse ecology in terms of precipitation zones. Species and ecological diversity is further complicated by soil type (degree and type of mineralization), altitude, and geographic location (for instance, Loyalty Islands and Isle of Pines have flora that is distinct from Grande Terre). In addition to the remarkable terrestrial environment of New Caledonia, the country is also home to important aquatic ecosystems. Its freshwater ecology also evolved in long isolation, and the New Caledonia rivers and streams are home to many endemic species. Moreover, the New Caledonia Barrier Reef , which surrounds Grande Terre and the Isle of Pines (Île des Pins), is the second-largest coral reef in the world after Australia's Great Barrier Reef , reaching a length of 1,500 kilometres (930 mi). Like its terrestrial counterpart, the Caledonian reef system has great species diversity, is home to endangered dugongs (Dugong dugong), and is an important nesting site for the Green Sea Turtle (Chelonia mydas). The Nautilus is a living-fossil species, common during the age of the dinosaurs, which survives today in the waters surrounding New Caledonia. In January 2002, the French government proposed listing New Caledonia's reefs as a UNESCO World Heritage Site. UNESCO listed New Caledonia Barrier Reef on the World Heritage List under the name The Lagoons of New Caledonia: Reef Diversity and Associated Ecosystems on 7 July 2008. Aside from the challenges posed by charting a course for the territory's racial and political life, the current government faces an additional challenge in balancing the needs of the territory's mining-based economy with the protection of its ecologically significant areas. Thanks largely to its mining industry, based primarily on nickel ore, some ecological safeguards have been deemed necessary by special interest groups to ensure the preservation of species in the face of industrial development or ecological exploitation. New Caledonia's ecological situation has gradually became known to the world at large. Of note is the recognition of activist Bruno Van Peteghem who was in 2001 awarded the Goldman Environmental Prize for his efforts on behalf of the Caledonian ecological protection movement in the face of "serious challenges" from Jacques Lafleur's RPCR party. Following political pressure, the government has implemented some modifications to its ecological protection policies – one example being the restoration of the famed Madeleine Waterfalls Preserve (Chutes de la Madeleine). These modifications have, however, been deemed insufficient by ecological groups. Progress has been made in a few areas in addressing the protection of New Caledonia's ecological diversity from fire, industrial and residential development, unrestricted agricultural activity and mining (such as the judicial revocation of INCO's mining license in June 2006 owing to claimed abuses). New Caledonian soils contain a considerable wealth of industrially critical elements and minerals, including about one-quarter of the world's nickel resources. Mining is therefore a significant industry that greatly benefits the territory's economy. However, the country is also home to numerous, critically-important ancient ecosystems . Thus, widely-practiced and indiscriminate open-pit mining across much of New Caledonia is claimed to be responsible for deterioration of the territory's natural heritage . The GDP of New Caledonia in 2007 was 8.8 billion US dollars at market exchange rates, the fourth-largest economy in Oceania after Australia, New Zealand, and Hawaii. The GDP per capita was 36,376 US dollars in 2007 (at market exchange rates, not at PPP), lower than in Australia and Hawaii, but higher than in New Zealand. In 2007, exports from New Caledonia amounted to 2.11 billion US dollars, 96.3% of which were mineral products and alloys (essentially nickel ore and ferronickel). Imports amounted to 2.88 billion US dollars. 26.6% of imports came from Metropolitan France, 16.1% from other European countries, 13.6% from Singapore (essentially fuel), 10.7% from Australia, 4.0% from New Zealand, 3.2% from the United States, 3.0% from Japan, and 22.7% from other countries. Though no longer a plurality, the indigenous Melanesian Kanak community still represents 44.6% of the whole population (as of 1996 census), their proportion of the population having declined due to immigration and other factors. The rest of the population is made up of ethnic groups that arrived in New Caledonia in the last 150 years: Europeans (34.5%) (predominantly French, with German, British and Italian minorities), Polynesian (Wallisians , Tahitians) (11.8%), Indonesians (2.6%), Vietnamese (1.4%), Ni-Vanuatu (1.2%), and various other groups (3.9%), Tamils, South Asians, Berbers, Japanese, Chinese, Fijians, Arabs, West Indian (mostly from other French territories) and a small number of ethnic Africans. Some of this immigration was a direct consequence of various conflicts around the world but in particular of the crumbling of the French colonial empire. 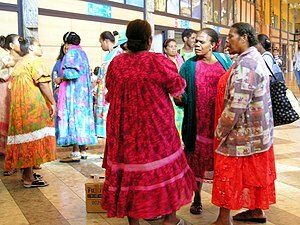 The Kanak are known officially as Melanesians. Similarly, those whose roots are in French Polynesia are known either as Tahitians (which excludes persons originating in the other archipelagos of French Polynesia) or simply as Polynesians (which would include both Tahitians and Wallisians, as well as many other minor groups). Whites that have lived in New Caledonia for several generations are locally known as Caldoches, whereas newcomers who have immigrated from metropolitan France are called Métros or Métropolitains. The European population also includes some pieds noirs who came after Algeria gained independence from France, some of them prominent in anti-independence politics, including Pierre Maresca, a leader of the RPCR. Within the official statistical category "Europeans" no distinction is made between Caledonian-born whites and French-born whites, though it is estimated that approximately two-thirds identify themselves with the Caldoche community while the rest see themselves primarily as French immigrants. There is a significant contingent of people that arrive from France to work for a year or two and others that have come to retire. The Caldoche usually refer to themselves simply as calédoniens and may be either white (mostly French or German) or white with an admixture of Asian, Melanesian or Polynesian ancestry. Caldoche culture has many similarities with Australia and Afrikaner culture. Until very recently the Kanak population held an economically disadvantaged position in New Caledonian society, while wealthy French expatriates formed the top of the socio-economic hierarchy. The Asian and Polynesian inhabitants dominate certain segments of the local economy. According to the 31 August 2004 census, there were 230,789 inhabitants in New Caledonia. This figure has increased to 249,000 as of 1 January 2009 official estimates. French is the official language of New Caledonia as in the rest of the French Republic . At the 2004 census, 97.0% of people whose age was 14 or older reported that they could speak, read and write French, whereas only 0.97% reported that they had no knowledge of French. At the same census, 37.1% of people whose age was 14 or older reported that they could speak (but not necessarily read or write) one of the 28 indigenous Austronesian languages of New Caledonia (see New Caledonian languages and Loyalty Island languages), whereas 58.7% reported that they had no knowledge of any of these 28 indigenous languages. Traveling to New Caledonia with a French class is common, especially in Australian and New Zealand schools. The New Caledonia football team began play in 1951, and was admitted into FIFA in 2004. Prior to joining FIFA, New Caledonia held observer status with the Oceania Football Confederation, and became an official member of the OFC with its FIFA membership. They have won the South Pacific Games five times, most recently in 2007, and have placed third on two occasions in the OFC Nations Cup. (2007): A new model Gondwanan taxon: systematics and biogeography of the harvestman family Pettalidae (Arachnida, Opiliones, Cyphophthalmi), with a taxonomic revision of genera from Australia and New Zealand. Cladistics 23(4): 337-361.